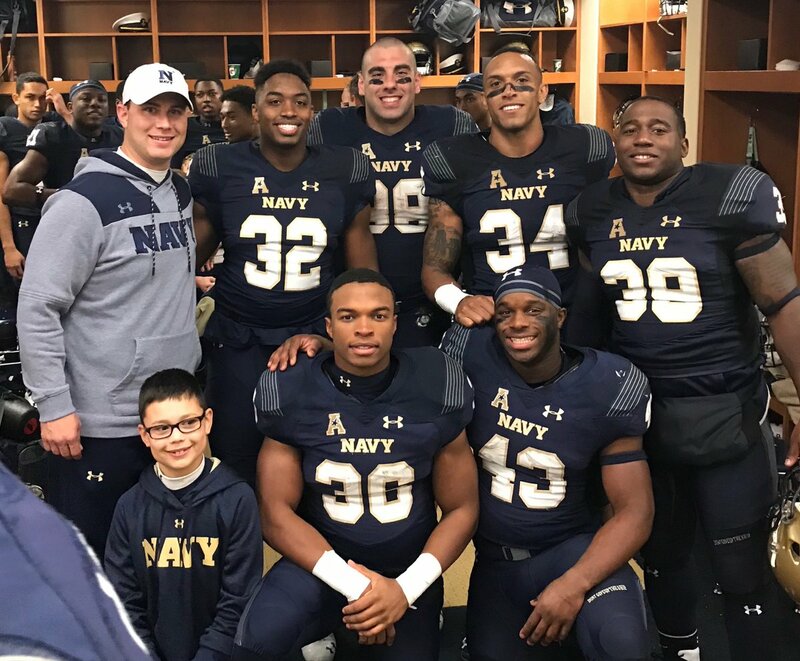 Mike Judge completed his 11th year at the Naval Academy coaching the fullbacks in 2018. Navy has compiled a 87-56 (.608) record during Judge’s tenure, beating Army eight times, earning nine bowl bids, winning five bowl games, winning five Commander-In-Chief’s Trophies and beating Notre Dame three times. Navy finished the 2017 campaign with a 7-6 record, which included a 49-7 rout of Virginia in the Military Bowl. The 42-point margin of victory was the largest by a Navy team over a team from the autonomy 5 since the Mids beat West Virginia, 51-7, in the 1963 season opener. The Mids played eight games against teams that went to a bowl game and played five teams that won 10 or more games. The offense set a school record by averaging 351.4 rushing yards per game. Navy finished the 2016 campaign with a 9-5 mark and a 7-1 record in the American Athletic Conference despite a season that saw the Mids have 102 missed games by starters or key contributors. The Mids played Temple in the AAC Championship Game and played in a bowl game (Armed Forces) for the 13th time in the last 14 years. The nine wins tied for the fifth most in school history and the team set school records for points (531), touchdowns (73), touchdowns per game (5.2), rushing touchdowns (61), total offense (6,136 yards) and yards per play (6.8) despite playing four different quarterbacks. In 2015, Navy won a school-record 11 wins against just two losses, qualified for a bowl game for the 12th time in the last 13 years, won a bowl game for the 10th time in school history (beat Pittsburgh, 44-28, in the Military Bowl), won a bowl game for a third straight year for the first time in school history, defeated Army for a series-record 14th consecutive year, won the Commander-In-Chief’s Trophy for the third time in the last four years, won the Lambert Trophy as the best team in the East for the first time since 1963, finished 18th in the country in both the Associated Press and Coaches polls and shared the West Division title of the American Athletic Conference with Houston in Navy’s first year of being in a conference after being an Independent for 134 years. Fullback Chris Swain was named First Team All-East and Second Team All-American Athletic Conference and was invited to the Senior Bowl All-Star Game. He rushed for 1,023 yards and 10 touchdowns on 211 carries. He was signed as a free agent by the San Diego Chargers. Navy finished the 2014 season with an 8-5 record, won a bowl game for just the ninth time in school history (beat San Diego State, 17-16, in the Poinsettia Bowl), won a bowl game in back-to-back years for the second time in school history and defeated Army. Navy finished the 2013 campaign with a 9-4 record, won the Commander-In-Chief’s Trophy, won a bowl game for just the eighth time in school history (beat Middle Tennessee, 24-6, in the Bell Helicopter Armed Forces Bowl) and defeated Army. 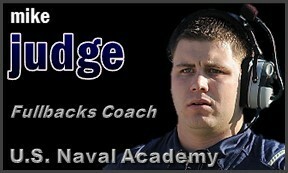 Judge helped lead Navy to an 8-5 record in 2012 and a berth in the Kraft Fight Hunger Bowl. Navy defeated Air Force, 28-21, in overtime and Army, 17-13, to win the Commander-In-Chief’s Trophy. The Mids posted an impressive 9-4 record in 2010, defeated Army for a series-record ninth-consecutive time, defeated Notre Dame in consecutive seasons for only the third time in school history and appeared in a school-record eighth-consecutive bowl game. The Mids finished sixth in the country in rushing offense (284.8) and ninth in the country in passing efficiency (156.7). The 2009 season was one to remember, as the Mids tied a school record for wins with 10, won a school-record seventh-consecutive Commander-In-Chief’s Trophy, appeared in a school-record seventh-consecutive bowl game and ran its winning streak against the other two Service Academies to an amazing 15-straight games. The Mids capped the season off with a 35-13 rout of Missouri in the Texas Bowl. The Mids posted an 8-5 record in 2008 and participated in the EagleBank Bowl. The Mids won the Commander-In-Chief’s Trophy thanks to a 33-27 victory over Air Force and a 34-0 win over Army. Other landmark wins during the 2008 season included a 24-17 victory over 16th-ranked Wake Forest, which was Navy’s first win over a team ranked in the Associated Press Top 25 since 1985, as well as Navy’s victory the previous week over Rutgers. Judge came to the Naval Academy from Harvard, where he served as the wide receivers coach. He has spent time around some of the best football coaches in the country, including serving as the quality control coach with the New England Patriots in 2005 and 2006. He spent his first year in New England working with Eric Mangini as a defensive assistant and in 2006 he worked with Josh McDaniels as an offensive assistant. Judge also spent four years as an intern on the Patriots staff during a time when they won three Super Bowl Championships. Judge received his bachelors degree from Springfield College in 2005, majoring in Physical Education. Born April 10, 1983, Judge and his wife, Jennifer, reside in Annapolis with their sons, Brecken and Kagan, and daughter, Kinsley.